Join us in Story Chapel for a special presentation by teacher naturalist Marcia Wilson and wildlife photographer Mark Wilson. 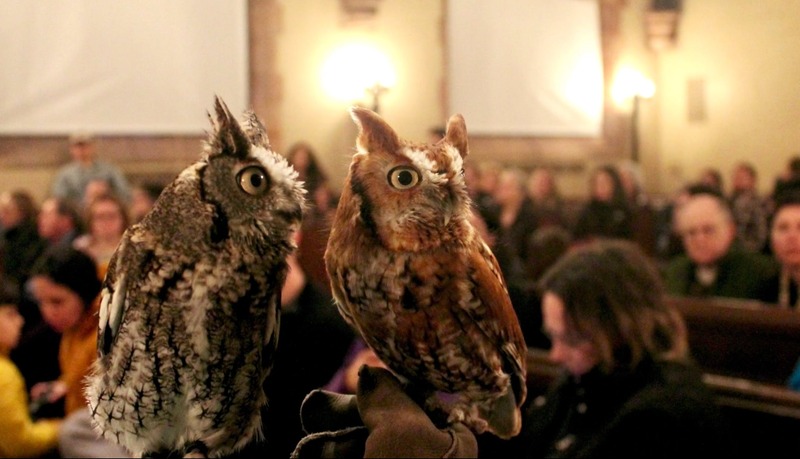 Marcia and Mark will introduce visitors to the owls of New England and beyond. Learn the field marks, signs, and naturalist’s skills that you can use to find owls without disturbing them, then meet some live owls up close! During this event we will also celebrate the release of Mark Wilson’s new book Owling: Enter the World of the Mysterious Birds of the Night. It’s a big kids’ book that explores all 19 owl species that call North America home. Owling introduces kids to people who work with owls – think artists, scientists, rehabilitators and teachers and is filled with more than 225 of Mark’s high action color photographs. Copies of the book will be available for purchase at the event (Price is $18.95 + sales tax). Two sessions will be offered on Saturday, April 13th! Space is limited, Registration required.